Inscribed on hard stone, possibly granite; some of the writing is hard to decipher. Much of the spelling is archaic. Inscribed on stone and much worn. 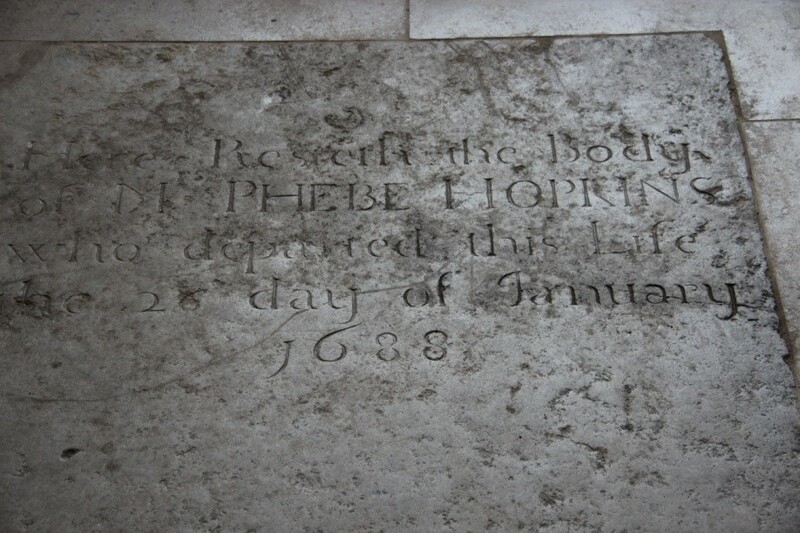 A ledger stone which lies in front of the West window, engraved with a dedication to Phebe Hopkins in Roman lettering caps and l/c. 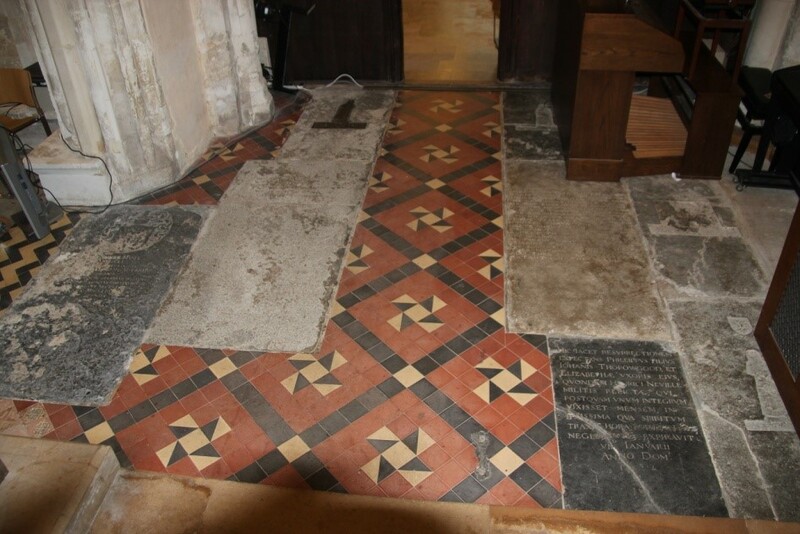 The inscription is on the top third of the stone which is shaped at the foot to accommodate floor tiles. 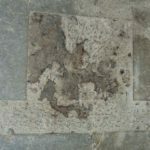 There is a crack at the foot across ¾ of width. Inscription in Roman lettering caps and l/c, written on the top two thirds of the stone. It lies in front of the West window. Letters underlined in 9 below are no longer visible. The top LH corner is flaked and the bottom LH corner is missing. 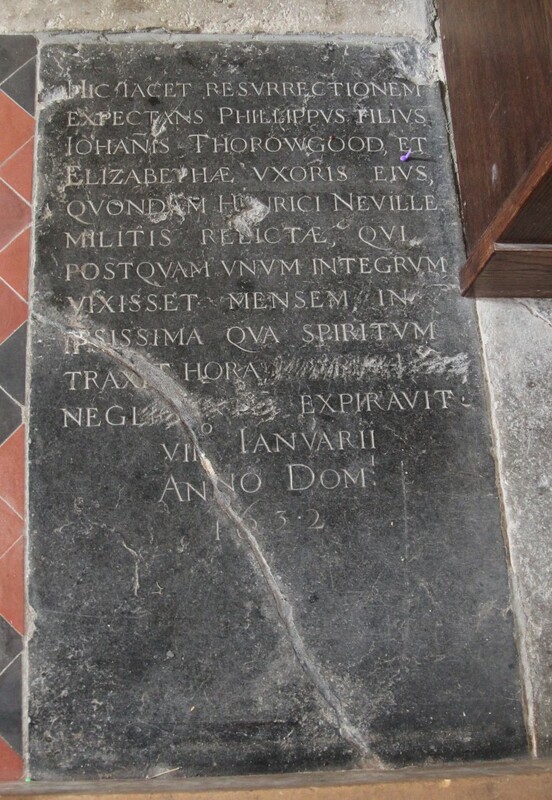 A wide ledger stone engraved with dedication to Samuel and Elenor Hirwood in Roman caps and l/c. The letters underlined in 9 below are no longer visible. The ledger is almost divided in half by an incised vertical line, and a separate inscription is written on both halves. 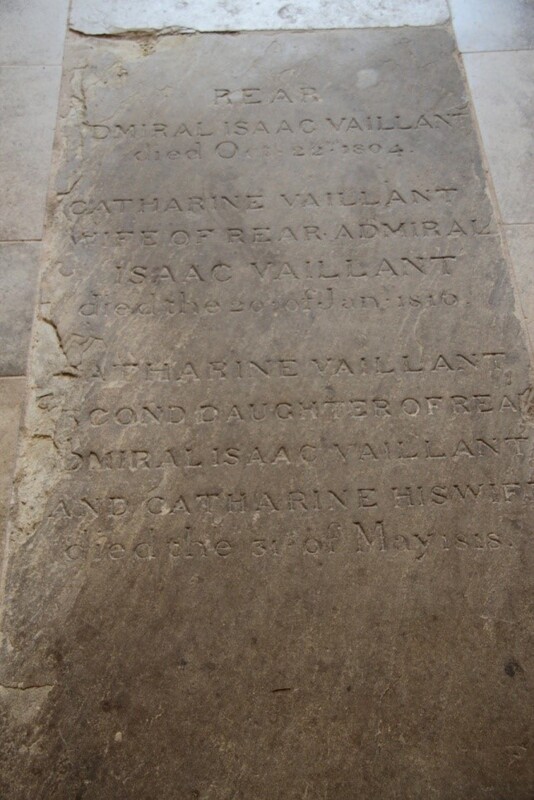 It lies in front of the West window, at the base of and perpendicular to the ledger stone of Isaac Vaillant. 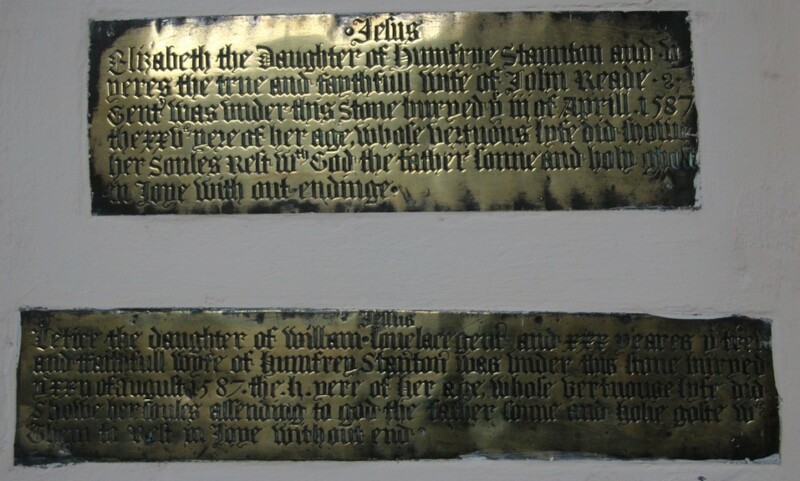 Both side edges are slightly worn and both sides have worn parts within the inscription. A dark ledger stone engraved with dedication to Elenor. The stone lies by the North door, under the chest (122) and font (222). 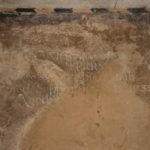 The rest of the inscription lies under the chest. 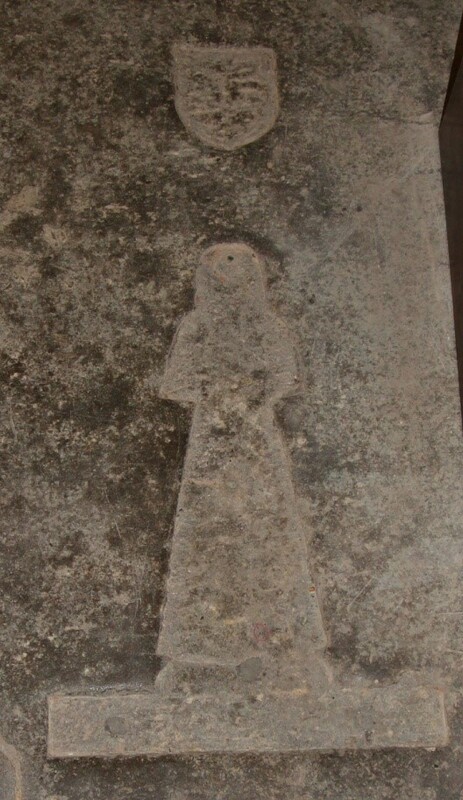 Ledger stone with a missing inlaid brass in the shape of figure of a man or woman standing on a rectangular inscription plate. There is no inscription visible on the stone. 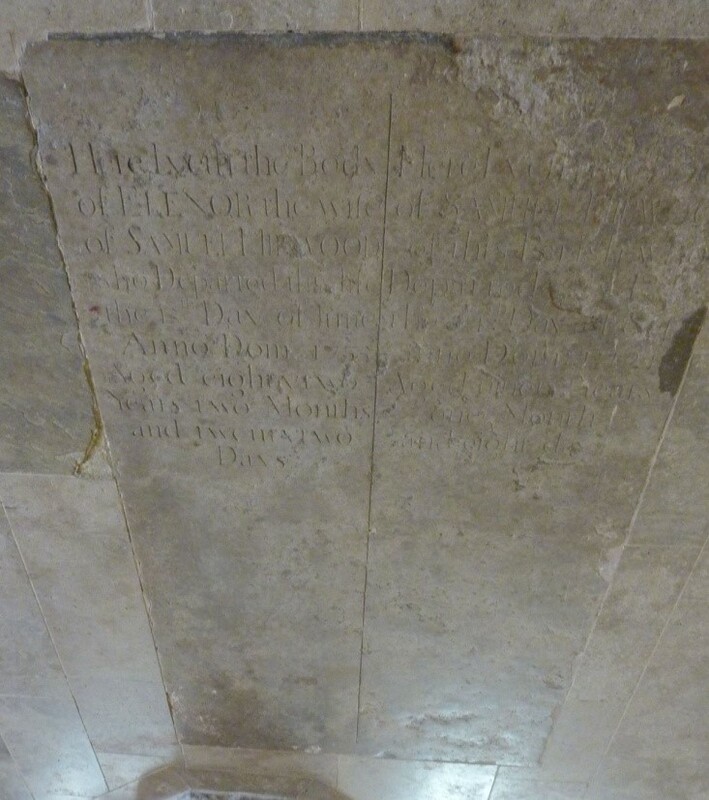 A very worn ledger stone at the west end of St. Catherine’s Chapel, partially under the organ, with a inscription in caps. Sometimes a ‘U’ is written as a ‘V’. Some words are separated by small diamond shapes, as indicated in 9. 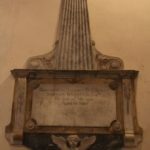 Some of the inscription lies under the organ, but was recorded by Ashmole. That part of the inscription is shown in italics below.. Much of the spelling is archaic. 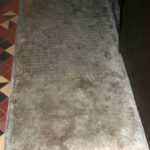 Here lies expecting the / resvrrection  richard ʃʃ / staverton the second ʃʃ / sonne of richard  staver / ton esqvier who deceas / ed the sixt t  and was / buried  the eighth of / october 1636 and left / behinde him elizabeth / his wif  and elizabeth / his only child now the / Wife of henri nevile . The effigies, or / Pourtraiture of which, there .ʃtandeth / above in the stone on the eaʃt wall. 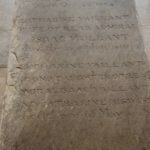 The inscription, in Roman lettering in caps only with ‘U’s represented as ‘V’s, and much archaic spelling, is written from about one third of the way down the stone. Some words are separated by small diamond shapes, as indicated in 9. Above the inscription is a naïve engraving of the Staverton crest. (Argent a chevron between three maunches vert). 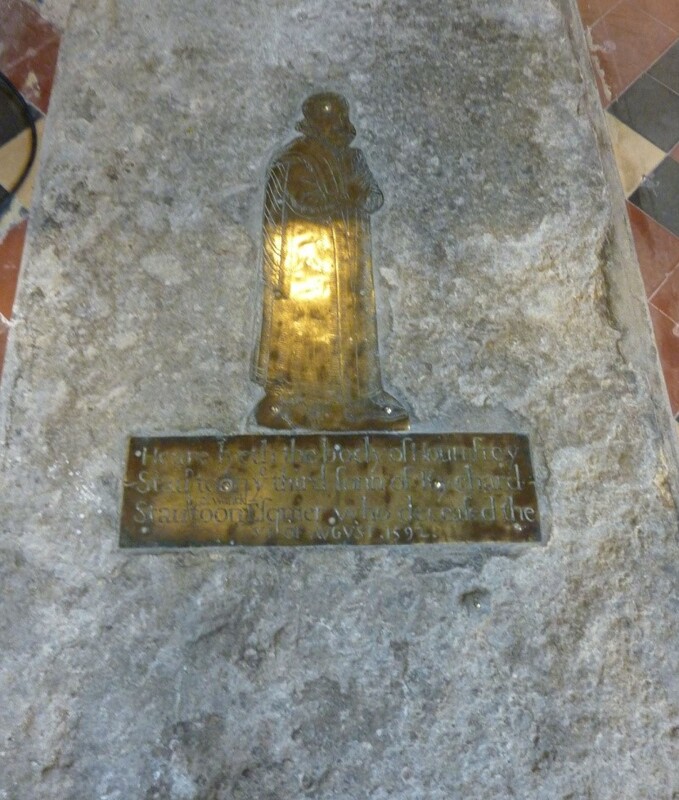 However, the brass plaque for Letice Staverton (040) (copied to end of this document), exactly fits the rectangular shape of the brass on this ledger stone. 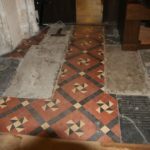 The square shape above it could well be for the figures of a woman, and behind her two sons and nine daughters, as described by Ashmole, . 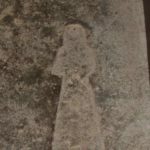 “On another Brass Plate, fixed in a Gravestone, …, are the figures of a woman, and behind her two Sons and nine Daughters; under them this Inscription. 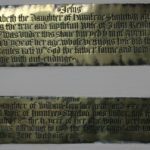 “ followed by the inscription on the brass plate 040. 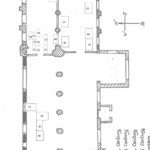 (ref Ashmole). 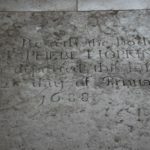 Philip Thorowgood, son of John and Elizabeth Thorowgood was baptised on 18th Dec 1632. (ref a) It appears he only lived to be one month old. 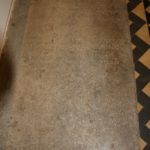 A light coloured ledger stone, very worn, with no legible inscription, positioned in the Chapel just in front of the step. Large crack runs from LHS to base. 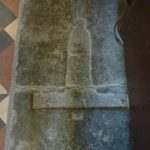 There are two inset holes, one of a shield (l. 12 x w. 10 cm), and below that, a slim figure on a rectangular base (l. 51 x w. 32 cm). 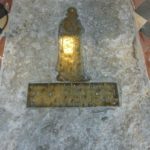 The brass plaques are missing. 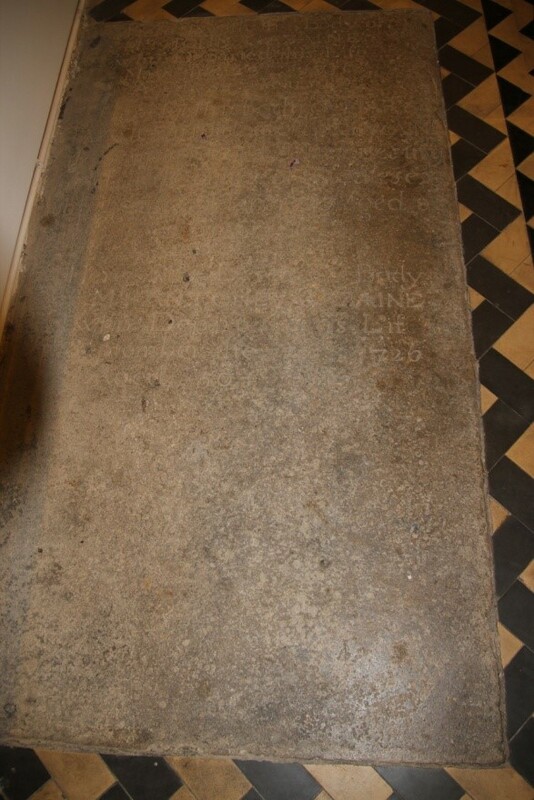 A very worn ledger stone, with an inscription, lying mostly under the speaker. 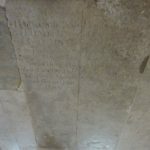 The inscription is in Latin in both caps and l/c. Underlines show missing characters. 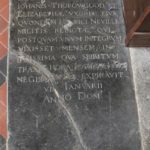 Although the inscription is very worn, the fact that it is in the ‘Staverton Chapel’, and the few words that are legible points to this being the ledger stone for Elizabeth Neville. 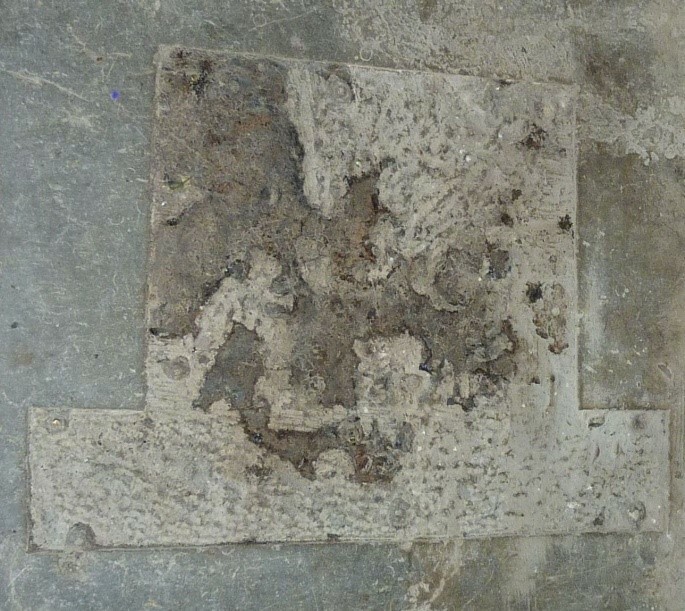 A very worn ledger stone, half under the altar frontal box. In a blue stone. Only a few words of the inscription can be read. 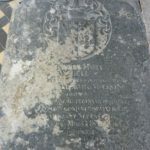 A dark coloured and very worn ledger stone, partially covered by some form of hard cementation, which obscures much of the inscription and the blazon. The inscription is in Latin u/c with the ;letter ‘V’ in place of ‘U’. 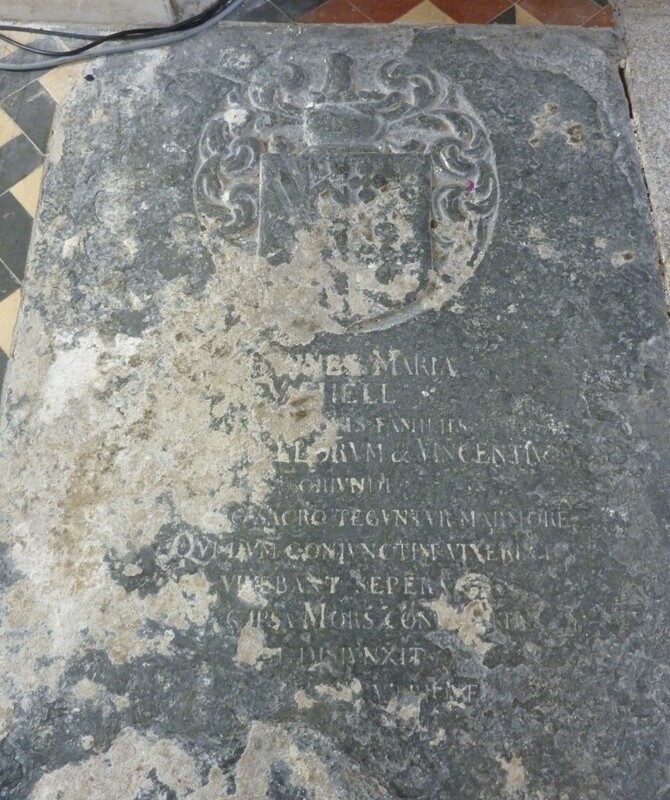 The stone is in memory of John and Mary Vachell who lived in the reign of Charles 1st. Their elder son Tanfield was MP for Reading in 1645. 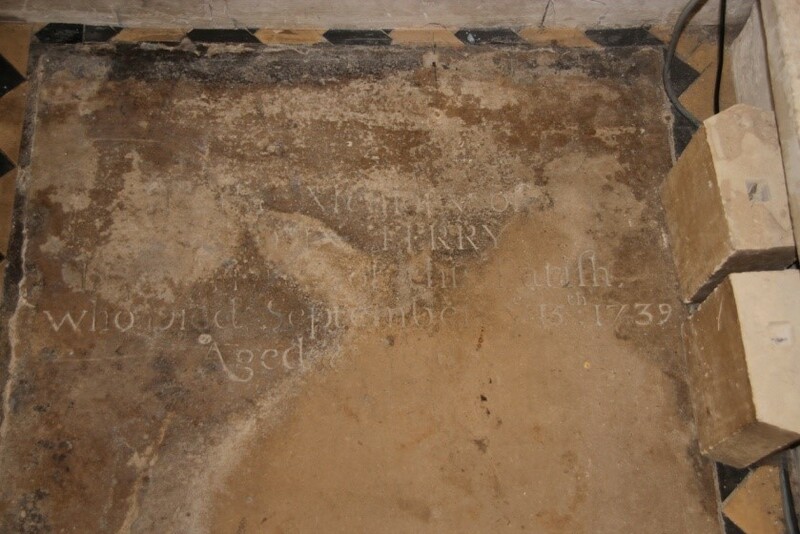 The inscription is now, damaged and difficult to decipher but it was recorded by Elias Ashmole before 1723. Two ledger stones, both extremely worn and each with a faint inscription, they are set together as if they were originally one stone. 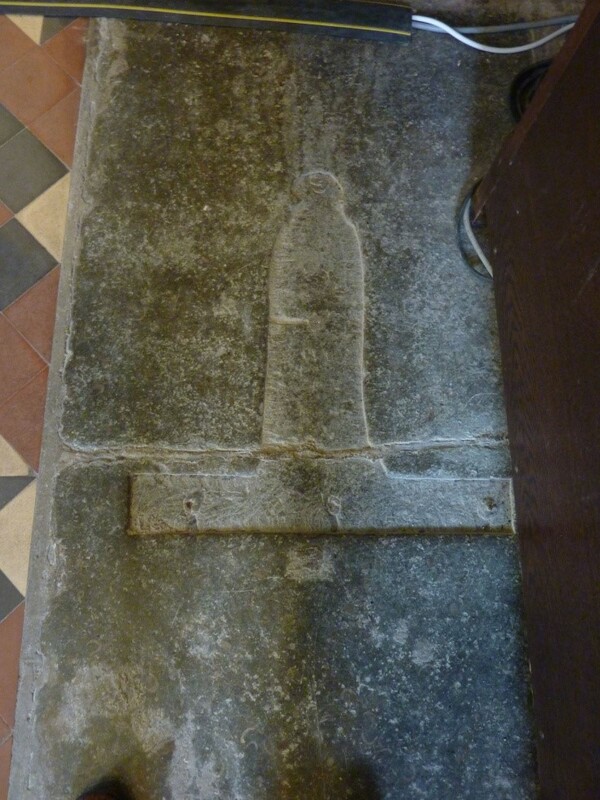 Positioned in the SW corner of the chapel. The W one has a worn engraving of the Staverton shield. (For blazon see 037) Just a few letters on each stone are visible. 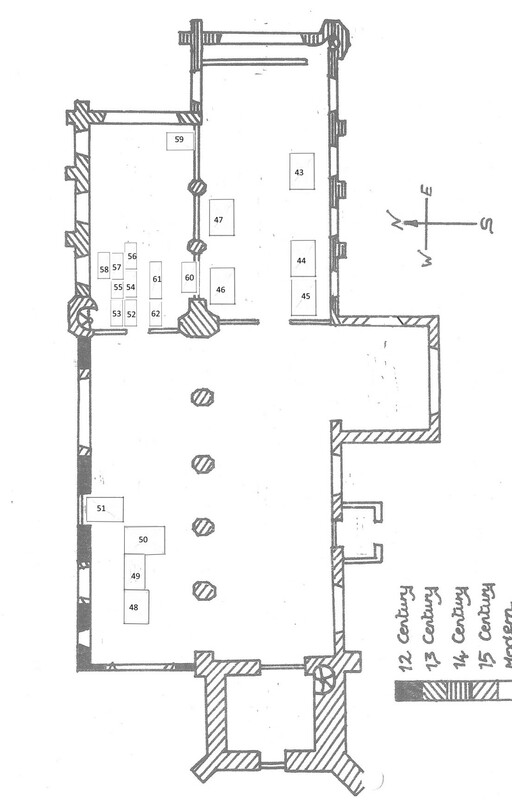 However, see point 7. 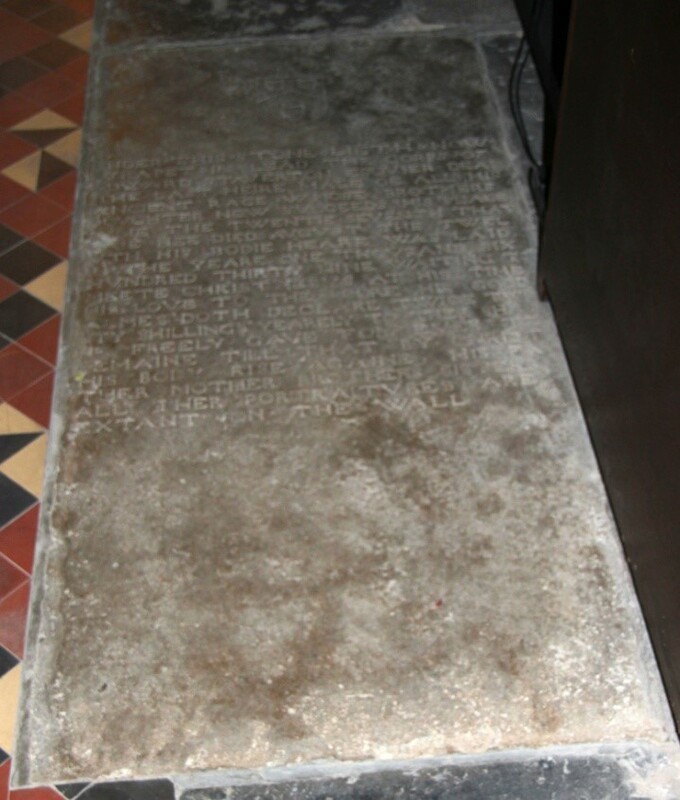 From the few letters discernable on this ledger stone, it seems likely that this is the stone referred to by Ashmole. Ashmole records “ In a Chapel situated on the north side of the Chancel, is on the top stone of a raised monument this inscription. 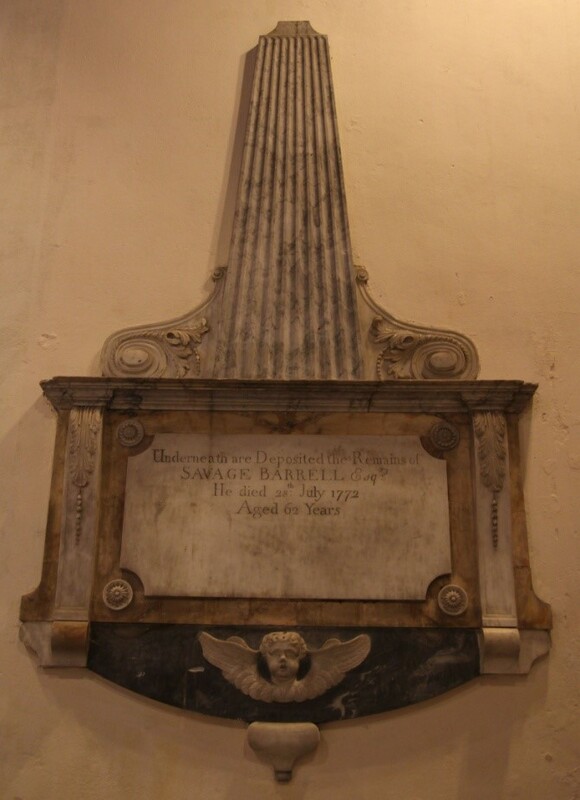 Savage Barrell lived in the parish of St Martin in the Fields, but requested in his will that he be buried in “a decent but private manner in the Chancel of the Church of Warfield in the county of Berks and that a monument be there erected the expense of which may not exceed one hundred and fifty pounds.” (ref a). 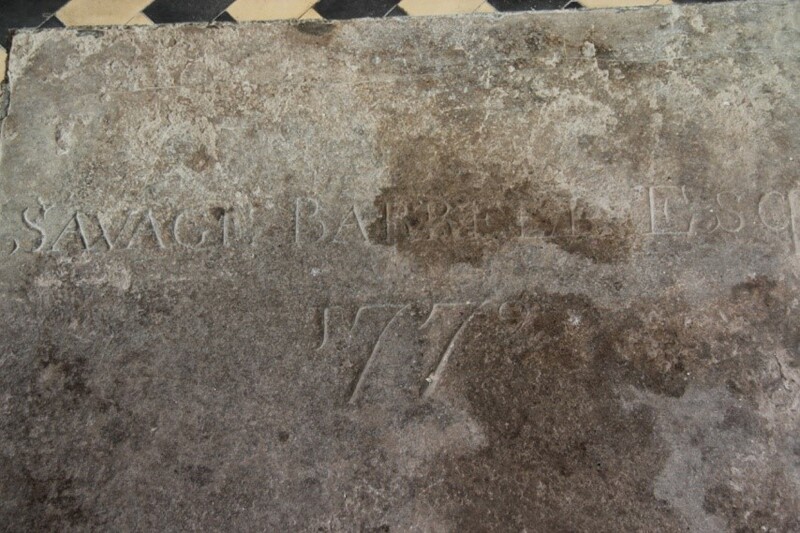 He was buried as requested on 1st August 1772. 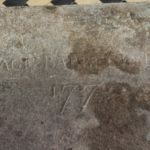 (ref b) His ledger stone lies in the Chancel: (047), as he requested, which suggests that this memorial tablet has been moved since 1772.